I have spent the better part of the past year working on our Mexican condo project and some things have been left to slide, such as my vast amount of sewing and quilting projects. But, hey, swimming and snorkeling are pursuits that I have enjoyed immensely and feel so much better for doing them. While in Mexico my fingers became itchy for hand work; crocheting, sewing, knitting, quilting. What kept my sanity was painting. I discovered at a lovely papeleria (stationery store), some paints, canvases, brushes and an easel. I started with a simple floral painting with a butterfly, and moved on to other techniques as well. The opportunity for creativity is very important to my feelings of self and happiness. Being back in Canada for a short time has given me the gift of sewing again. My husband’s sister-in-law has gotten into quilting this past year and we like to send photos to each other of what we are working on. Yesterday, her comment was on how perfect my sewing was. I never thought much about that until today as I was sewing more pieces together for the next block in the quilt. I realized that over the years I have gained skills in piecing and sewing to be able to have my quilts look pretty good, everything matches, points still stay pointy, and blocks lay flat. If you are a quilter, you can appreciate what I am saying! Did this skill come immediately? Certainly not! My friend, Wendy, is a piano teacher and also volunteers in the community as a pianist for events. She says that people always come up to her to tell her how wonderful her talent is and that they wish that they could play the piano as well as she does. She immediately tells them that they absolutely could be as good as her if they dedicated the amount of time that she did to be where she is. One of my sons-in-law, had the desire to change his life. He has accomplished an incredible feat of being clean and sober for over a year now. He set some very honorable goals of becoming educated in fitness and health. It has brought such a feeling of joy to see him make changes and progress. After 10 years of drug use, he marvels at how much better he feels and thinks now. He had to get up and do it again and again to get to where he is today. This adage goes for whatever skill we wish to be proficient at. Where do you spend your time? Do you have a goal to become skilled at something? I think back over the past 20 years and specifically about the goals that I had. I wanted to open a quilt store and share my love of quilting with others. Well, that did happen and I did have the opportunity to share quilting plus many other avenues were opened to me through this venture. I learned to use both sides of my brain to be both analytical and creative. I am a big believer in education and I loved to take courses to learn and be better at what I was doing. There was a constant drive to learn and grow and make progress. My day usually started at 5:00 a.m. and I sewed for 3 hours. Then I went to my store and worked there for an average of 8 hours. Those who run a business know that working on your business can be a 24/7 venture. I came to the point where I had to tell myself, that I wasn’t going to finish what needed to be done and it was time to go home and decompress. My husband half jokingly called the store the “Black Pit of Time”. It seemed to be never ending. But…I developed so many skills running that business and I am always grateful for that opportunity. Some days it feels like I am making progress and then BAM! Three steps backward, I go. Two days ago, I was singing the frog song, “Rip it, Rip it, Rip it out!” I wasn’t used to making sewing mistakes. I stopped and thought about it. Maybe 20 years ago, I would have said, “Oh, well…carry on”. But, I’ve learned that one mistake will compound into a larger one unless taken care of. Quilt blocks do not fit nicely together when they are different sizes than they should be. So, it is with our lives. It is easy to feel discouraged when we continue to make mistakes. When you start changing and doing better, you can feel amazing. Remember that saying…doing the same thing over and over again and expecting different results is just insanity! A few years ago, I was thinking about my life and what I needed to do to have a better relationship with God. A simple way is to read the scriptures. I thought, well, easier said than done. How many people start reading the scriptures, feeling gung ho and then two weeks later something disrupts their schedule and they fall off their track? So, I decided that I needed a concrete goal with a schedule to stick to. To read the entire scriptures in a year and do it every year, I read the Old Testament in 6 months, the New Testament in 3 months and the Doctrine & Covenants and Pearl of Great Price in the last 3 months. Simultaneously, I read the Book of Mormon 4 times each year. It sounded like a lot and a little crazy, but I thought about where I dedicate my time to the Lord and this seemed like a way to accomplish my goal. It is pretty easy to get up in the morning and check emails, social media, the news, etc. I decided that I was going to study my scriptures first thing in the morning instead. In exchange for this fantastic life that God has given me, how could I not give Him at least 30 minutes in the morning? 30 minutes out of an entire day…seems reasonable. Well, my goal did not run perfectly all the time. On a out of ordinary day (flying at 6:00 a.m., leaving the house at 3:00 a.m.), I would say, “Oh, I’ll catch up later in the day…or tomorrow”. That was a slippery slope! The adversary does not want us to read our scriptures or become closer to the Lord, so implanting those thoughts into our minds, is a great detraction from our goals. I quickly realized what was happening and then worked harder to do what I needed to be successful. Life is certainly not smooth sailing all the time. The storms and ills come our way. But the more we get up and try again, the stronger we get. As we continue to strive for worthy goals, the Lord will bless us for our continued efforts. Sometimes it feels like those blessings are blowing in the wind somewhere else and not towards us, but I can tell you that they are definitely there. No matter the goal or the changes you want to make in your life, it can happen with a sincere desire. If support is needed, it will be there. I love how God puts us each to use in other’s lives. We can be the angels of hope and love to each other. Then we have our legion of ancestors who have passed on and act as our angels from heaven, wanting us to be better than ever and wanting to help and support us. All we have to do is get up and do it again, making progress within our lives. So much has happened in the last 6 months (as you can imagine)! We have been busy preparing even more in our lives. I met a gentleman on a plane who said that I needed to be writing more of our experiences. I love these “nudges” from the Lord! Erik & I then started working on the moving boxes and doing even deeper purging. Many more items went to the Lacombe thrift stores. Erik started posting items for sale on Kijiji. While we were continuing along this vein, I started wondering what we needed to do to procure the job that Erik would be doing in the Middle East. Because we had been working so physically hard for the past year, it felt like we needed to continue with the hard push. One day, in my prayers, I was asking and the Lord said, “Be still, I am preparing the way.” Wow! Be still…now there’s a concept. Quit racing your mind and be still. A change of perspective needed to happen yet again. Early in January, my friend Julie called and said that her husband was on his way to the Middle East for some meetings for their company. She wanted to know if David could use Erik’s name as a petroleum reference for their company. I agreed and we carried on. By the middle of January, we received an early morning call from David. Erik was on the phone for an hour and then tells me that David has a contact that is interested in dealing with us. Excitement starts to build as we think that something will happen soon. Julie sends me a message that evening and said that there have been new developments and our interest is piqued even further. We talked on Monday morning and Julie outlined some of David’s experiences in Kuwait and we talked about paperwork that we needed. One item that we were missing was our marriage certificate. If you want to live together in the Middle East you need to prove that you are married. When Erik & I were married, the Bishop put the wrong date on the forms. I ordered a marriage certificate afterwards and discovered the error. Unfortunately, we were poor students and didn’t have the excess funds to correct this mistake and I tossed the certificate because I didn’t see any significant reason to own a marriage certificate. Fast forward, thirty three years and discover that it is important to have this piece of paperwork. Perspective! I go immediately to Registries that day and order a new marriage certificate. At this point, I don’t care what day the government thinks we were married! After I turn in the form I filled out, the clerk looks at her computer and says, “Oh, there’s a problem!” Really!?! Another error was discovered in that Erik’s middle name was interpreted incorrectly. It needs to match his passport, so I pay for two certificates and go home to await an amendment letter from Vital Statistics. After a month with no letter, I felt like I needed to call Vital Statistics and find out the status of our amendment. They proceed to inform me that they are only working on October’s amendments and that we wouldn’t receive our amendment request for months; maybe May or June. I’m slightly exasperated at this point. After getting off the phone, I said to the Lord, “Well, you have the details. When you need it to be ready, it will be ready.” The middle of April our amendment letter shows up and we immediately take it to a lawyer’s office to be notarized and sent back to Vital Statistics with yet more money. Now we are waiting on the certificates to show up! In February, we were on our way to a funeral and as Erik was driving, I closed my eyes and asked the Lord if the job was going to come through David and his contacts. A beautiful brilliant white light surrounded that thought. Then I asked if we were to look elsewhere and a black curtain came down on that thought. Well…that was a very clear answer! We knew we needed to focus on that line of contacts. Previously, the Lord has said to me that the job was going to come in a way that we didn’t expect; not your typical hand in a resume and have an interview. We were getting promptings to get our house in order to prepare to leave it. We managed to clear everything off the veranda. Within a two week period, the Lord sold our tractor, acreage mower, elliptical, two quads, and a quad trailer. It is very exciting to see His hand at work. We felt like it was taking a long time for the Middle East job to materialize and were itching to do something. Between me feeling sorry for myself about not being able to go on a cruise this year and needing something to do, we thought that we should go to Mexico and find a property to start our vacation rental fleet. When I asked the Lord if it was okay to go to Mexico, he replied with a not-so-hearty, “Okaaay.” We came to Huatulco and after seeing four properties decided on one and made a deal. We had been to Huatulco nine years ago and fell in love with the atmosphere there and authenticity of the area. Was this another distraction? Perspective about life is different now. Back in Alberta for April, we did more preparations on the lake property. Erik & Braeden did landscaping and laid sod. Erik was building steps and finishing the addition to the deck. I was preparing a list for furnishing the condo in Mexico and quilting placemats and quilting a large quilt to hang in the master bedroom. I’m feeling more at peace that the Lord has everything in hand. It is truly a miracle in the chaos of the world around us, that we are doing so well. The Lord looks after our needs. Erik hasn’t had a job in 16 months, myself in 11 months and still He sustains us. I have recently said, that we are running out of things to sell, to live off of, haha! Well, there is definitely more we could sell if we needed to. Perspective. As of this writing, we are in Mexico preparing the condo for renters. The furnishings are coming together and Erik has been great at figuring out all the ways to get the most out of our finances as to transfers and exchanges. The Marina is directly below us and yesterday we saw a big 8 foot marlin come in to the dock. What a blessing to be here and learn more of the culture of Mexico and forge relationships with people. My seatmate on the plane from Salt Lake City to Mexico City made the 3 hour trip go so quickly as I shared some of our experiences with him. He kept saying, “You understand how unusual this is?” Well, this new life has become our new norm and I think we sometimes forget that what we are doing is unusual. As Trevor said, “Living without purse or script.” Yes, our perspective has definitely changed as to what and how we “should” live our lives. When giving your life over to the Lord’s will, your life can become even fuller and more abundant. We are not without trials but I see that these trials come through lack of faith in whatever the circumstance happens to be. Peace truly has come to us through our faith in living how the Lord would have us live. He truly sustains us and provides so many opportunities for growth and learning to love even more. In Salt Lake City, the baggage clerk, turned to us without preamble and said, “You two are going on to do great things. I feel it in my heart.” What a beautiful confirmation of the love that the Lord has for us! As I walk each morning observing and trying to take photos with my cell phone, I think of the life of geese as something very symbolic that we could take heed to and process in our own lives. Geese mate for life and usually wait until they are mature birds before choosing their mate. They are extremely loyal and have very low “divorce” rates. The young geese will generally return to the same nesting sites as their parents. There is caring for those who are weaker. I loved hearing the geese having discussions in the mornings. 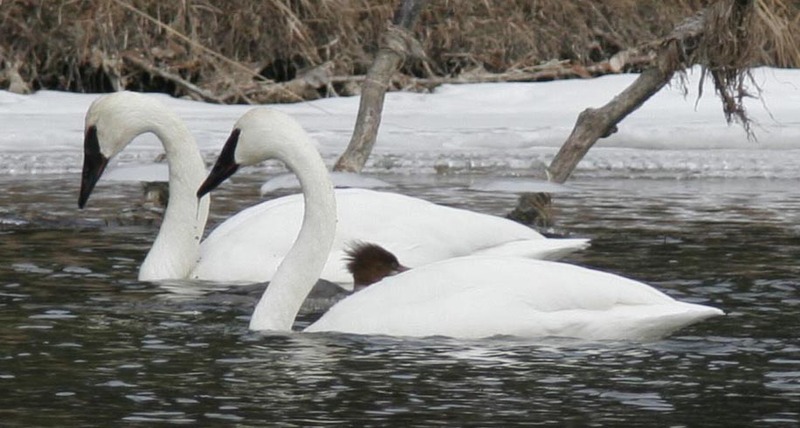 Watching the Trumpeter Swans gives me so much joy. They are so elegant and graceful. Because they are snow white, they stand out from the crowd. They truly do sound like a trumpet blowing when they are flying overhead. They remind me to know who I am, stand apart from the crowd, live up to my standards as a daughter of God and get along with others. Erik & I are in the midst of our own journey. Both of us are feeling the same right now. Last week, as I was driving to a massage appointment, I started my own pity party because my whole life that I knew was gone. I’ve had to give up everything that was familiar to me. Erik is now acknowledging that he too, is feeling the same way. But….I had to sell my motorcycle and he did not! See, that pity party is creeping in again. I had to stop myself and say out loud, “Your life is NOT gone, your life has changed!” True, our life is just different now. Everything that was comforting and was our routine is gone. Those things were just things…material things. Our relationship with God has strengthened. Our relationship with each other has strengthened. Our daughter, Meaghan was talking to us at the end of August and said, “Mom, don’t worry about the house being perfect, just get it listed and on the market!” It struck a chord with me; that I knew that the Lord was sending another message to us. I read a little blurb about humans being natural collectors. I think that stems from our hunter/gatherer days. Unfortunately, we have collected a lot of “stuff” over our 33 years of marriage. Sorting through it all is exhausting! In mid November, I was walking the dog one morning. The solitude is a perfect opportunity to commune with God and have a discussion about how life is going and what He wants me to do. I said to the Lord that we were about to put our house on the market. I asked Him if this selling was going to be a long drawn out process or would things move quickly along. He answered me with, “You will be out of your house before Christmas, by December 18.” I said, “Wow, we have a LOT to do!” He replied, “Yes, you do, now go home and get to work!” We listed our home and within 3 days it was sold. The closing date is December 18! I still get a thrill and a giggle out of how the Lord knows everything. Now, we are working our little hearts out, to sell our belongings and pack what we think we should keep. We’ve had an opportunity to meet with the new owners of our property and I am so thrilled to know how their lives have synced with ours in this whole process. The Lord’s hand has been involved in both of our lives to make this happen. They too, have a love of the Lord and recognize His influence in their lives. I cannot overemphasize the tender mercies of the Lord and His deliverance of joy and caring in our lives. I know that He has important work in these latter days for His disciples. As Christians, we need to band together and strengthen each other, uplift and share the goodness that happens from having Christ in our lives. It is through His Atonement that we have a hope for the eternities. I will stand firm and in holy places to receive the blessings that I know will be forthcoming to those who follow the Lord and proclaim His goodness and mercy. We keep hearing, “Well….good luck with everything!” I know that people are well meaning but in my mind, we don’t need luck. The Lord has us in His hand and He will provide all that we need. We will do the work that needs to be done for our progress and the Lord allows us the opportunity to continue in our learning process. I always think of the scripture Matthew 6:26, “Behold the fowls of the air: for they sow not, neither do they reap, nor gather into barns; yet your Heavenly Father feedeth them. Are you ye not much better than they?” He loves us because we are His children and will provide. Sometimes we need help from others and this helps us to have humility. Most importantly, we need to have faith, unwaveringly. Somedays, Erik and I feel very inadequate because of all that needs to be done. One chore after another and soon it will be done. Go forth and have faith. We are trying our best and hope all of you may do the same. Be of good courage and help to strengthen one another. Give service and help others to feel a little better. This season of the year certainly reminds us of having the spirit of love within us. To carry it throughout the year is to better ourselves and become closer to God. We had been so focused on the task at hand for months. Closing the quilt shop turned out to be a VERY exhaustive process. Even Erik, said that he didn’t realize how much energy it was going to take to close the store and deal with everything there. By the end of June we had closed the store and had rented a sea can to store all the inventory. Erik had been extremely worried about the inventory regarding where it’s final destination was going to be. I had been sitting at church one Sunday and was asking the Lord if He had a buyer for the inventory and he said that He did. At that point I quit stressing about it. As sometimes in life, we feel like we just live from one crisis to another; it is exhausting to live that way or to have that mindset. We did have other goals that needed to be met and needed to shift our focus from the store to our home and job search. BUT….as life goes, it’s not all about moving and finding a job. Erik was booked into the West Coast Trail for the second week of August. This hike is 77 kilometers long and takes about a week for the average hiker. The preparation that goes into doing this feat is enormous. It’s enormous if you want to be successful (clarification needed). Everything that is packed in must be packed out. Only a certain number of people are given permits each year to hike the trail. Members of our family had done the hike in 2006 and wanted to do a 10 year reunion of the trail, but Erik said that this was the year to do it. Thus the preparations began and the progress slowed on our move. There were many phone calls between Dad and the Trail kids giving pep talks and figuring out equipment. We had a cousin coming from Germany to do the trail as well. The excitement was building and it wasn’t for the task at hand. 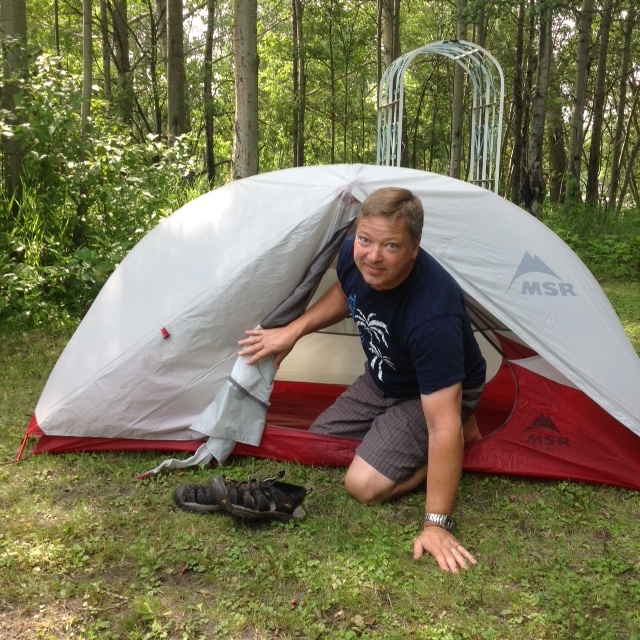 This is Erik preparing a tent for hiking. One of our children, her husband and our grandchildren made a move at the end of June and left Calgary to go to Victoria. They were moving for the west coast lifestyle, sold their home and bought another on Vancouver Island. It was sad to see them go, as we tend to be a close knit family, having family dinners each month to celebrate birthdays, and to catch up with what is going on in everyone’s lives. Another distraction…. A dear friend was getting married and I decided to attend the wedding. Erik headed to Vancouver Island for the hike and I headed to the airport for a flight to the wedding. All of this was eating into our time that we probably should have been working on our move. After the wedding, I had a couple of days at the lake before flying to Victoria to meet up with my husband. While on the Island, we had to opportunity to visit with both family and friends. Up to Comox to see Erik’s mother, then on to Qualicum Beach to visit my dear friend Julie and her husband Dave. From there we went to see Erik’s sister who lives in Cowichan Bay. 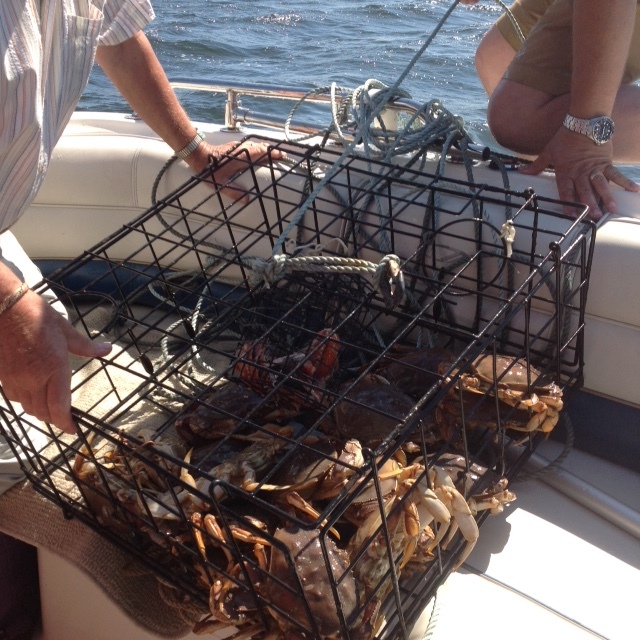 Her husband took us out boating to go crabbing. We caught a mother lode in the trap and had quite the feast. Then we headed back to Victoria to see our daughter’s family again. There is something about that West Coast lifestyle…no screens on the windows because they don’t have weird bugs trying to get into your house to eat you. Although, the first night in Victoria, I got up at 4:30 am and decided to visit the biffy. As I approach the bedroom door, I hear a soft meow and then another. I said to Erik, `Do they have a cat?” “No!”, he replied. I opened the door and there was the most gorgeous long haired, tuxedo cat standing there looking up at me. I bent down to pet the cat and it started purring right away. I’m wondering how the cat got in the house! Open doors…open windows….hmmmm. Erik got up to take the cat outside and we settled back down again. We didn’t seem to be in any hurry to head back to the mainland. Usually, Erik is the antsy one and ready to head home but he wasn’t making any indications that he was ready to go. More days went by and finally we decided to make the trip back to Alberta. We thought that we would catch the noon ferry, but that came and went while we were at the beach with our grandchildren. Then the one o’clock ferry came and went….finally, Erik said, “We better get moving to catch the two o’clock ferry.” We drove straight onto the ferry with no wait time. Kamloops was the place to rest our head that night. Everyone on the Island wanted us to move there and so when we got home I went online to look at real estate. We got the idea in our heads that maybe we should sell everything in Alberta and buy property on the Island. I did find a beautiful ocean front property in Cowichan Bay that brought tears to my eyes with the view to the ocean. Now we had questions…what to do? While at the temple, I sat and pondered our situation. I asked the Lord what we should be doing. He replied, “Stay the Course! No more distractions, do what I asked you to do.” Well, that was pretty clear! We came home with a renewed fervor to make progress. Our original goal was to have our house ready to sell by June 1. That date came and went and then we thought maybe we could get it done before the West Coast Trail trip…nope! So here we are in the middle of September and still working away. The weather is starting to turn against us as far as the outdoor work; fickle Alberta weather. I love how the Lord brings people into your life to help you with learning. While in Lacombe for church, I introduced myself to a gentleman that had worked in Dubai and had taken his family with him. He introduced me to his wife and she was so excited to tell us how wonderful it is there and how amazing the church is there with all the members. It touched my heart so deeply because it was another witness as to the Lord’s plan for us. While we deal with our distractions, it helps to know of the love that God has for us to keep us moving forward. In mid July, I was worried that I didn’t seem to be progressing very well on the sorting and packing of our home. I felt like I was slogging through mud each day instead of being my usual cheery self. Then one day I took a trip into Calgary to do a few errands. I met some amazing people on that journey and by the last errand at Costco, I was helping the girl doing demonstrations for pressure cookers. I was talking to people and drawing them into the demonstration. As I was getting to know the demo girl, she asked me about what I was doing in my life and so I told her about how God has directed us to move to the middle east. She got so excited and told me that she too prays for guidance and that she could feel that I was surrounded by spirits who were protecting me. Amazing, who you run into! As I was driving home, I came to the realization that I missed people. After 15 years of having a retail business and talking to people, I missed talking to people and getting to know them. That brought peace to my soul to discover why I had been feeling a little blue and that I needed to get out and visit with people. I think that a bit of a break from renos and packing was good, but it is definitely time to focus and get crack-a-lackin’ along. We are so close to a breakthrough that I can nearly taste it. Do you have distractions in your life that are preventing you from reaching your potential? Sometimes we need to work just a little harder to go around or even through some of the obstacles that are thrown at us. Some obstacles are of our own making but we need to persevere to achieve great blessings. One of the thoughts that always comes to my mind is to think of how much you love your children and grandchildren and how you would do nearly anything to ensure their happiness. How much greater is our Father in heaven’s love for us! He who is of infinite love, wants most especially for us to experience joy and love. Sometimes the greater joy comes after great adversity but only if we learn to rely on the Lord for all. Knowing that He wants the best for us will ultimately help us to overcome if we rely on the arm of the Lord. Wallowing in self pity doesn’t get us very far and remember the Lord doesn’t want us to muck about feeling bad but the adversary certainly loves it when we feel rotten and spread that little black cloud of gloom around. Life is to have joy and to make progress to become the best that we can be. So…spread your sunshine and go forth being sunny and bright! After receiving confirmation that the Lord did indeed want us to go to Dubai, we considered how and when that was going to happen. In our naivety, we thought that we might be able to consolidate our lives in approximately two or three years. The thought of moving was still like a mustard seed; very tiny but with great potential. Late in November 2014, I was driving home from work and received an urgent feeling that I needed to start sorting out my sewing supplies and getting rid of household items. Being a dutiful daughter of God, (but can procrastinate like the best of them), I thought that I would start with the front entry closet. There are NO sewing supplies in that closet! I sorted through everything and gathered a huge bag of shoes; many hundreds of dollars worth of footwear. I donated everything except my motorcycle boots and my sandals. I thought that I was off to a rocking start. Not much more happened after that. It was inventory time at the store and Christmas was soon upon us. By early January, we were at the temple and enjoying our time with close friends. I sat and asked the Lord how we were doing with His plan. Were we moving fast enough? He immediately responded with, “No, you’re not! Move faster!” Then He showed me two more visions; one was of the bow of a boat moving through water. It was a closed bow boat that I had never seen before. Then He showed me my husband walking along wearing a long light colored tunic and long light colored trousers. I marveled at these vistas, wondering what they could mean. When I returned home, I started searching online for Dubai websites and saw people wearing the clothing that I had seen Erik wearing in my vision. My heart expanded and wonder filled my mind. I had to decide about a trip to Florida for the end of January and thought that I probably shouldn’t go due to cost and expense for my store. As I prayed about whether to go, the Lord affirmed to me that, yes, I needed to go. So, after some legwork, I was able to share the cost with a fellow shop owner and prepared to attend this seminar. The first two days that I was there, I received a distinct feeling that we were not going to live in Olds for even the remainder of this year. This was a little unsettling as we thought we had some time to make our changes. After the second day, I asked the Lord, “When are we moving?” As I sat quietly waiting for an answer, He showed me a pie chart, which had January at the bottom. As I looked at it, there was an arm that started at January and worked itself around to past half way. I said, “That’s August!” He replied, “Yes, it is.” WELL….it was actually very comforting to know that we had a definite timeline. The next day, my husband had been trying to get me on my phone. I wasn’t answering because of being in the seminar. After I turned on my ringer and saw all the missed calls, I went to the lobby to phone him. He said to me, “I’ve been trying to reach you all day! Do you remember how God said that I needed to change jobs?” “Yes,” I replied. Erik then said, “Well, today I lost my job!” All I could say was, “Oh, boy!” Erik replied, “He’s kicked His plan into high gear! !” My adrenaline rush hit me hard, as I contemplated what this meant for us. I wasn’t feeling fearful that my husband had no work, because I knew that the Lord had a plan for us. I was feeling like I needed to be home to just be in the same room as my husband and start working on the future. While in Florida, one of my sisters, phones me one night. We start talking about all the things that are going on and to be honest, I felt like all of a sudden, life was zooming right along and was what I had experienced real. Did the Lord really show me these things? Does He really want us to move halfway around the world? It started to feel a wee bit overwhelming. My sister has not been active in church for 35 years and has never been in a temple. Then words come out of her mouth that stun me, because I never thought that I would hear her say what she did. She says, “Cheryl, you know how sacred the temple is, right?” “Uh-huh,” comes my reply (dubious thoughts about where this is going). Then the zinger….”Cheryl, you have to know that whatever God shows you or tells you in the temple is absolute truth.” I was gobsmacked! I contemplated her words and by the next day, the Lord confirmed to me that my sister was His messenger for letting me know that, yes, indeed, life was about to change and that He had a plan for us. From then on, I had no doubts at all. Erik was working on renovations all winter and into spring. He wanted to get the basement renovations done first. Two years ago, we ripped out all the cedar tongue and groove paneling that lined two basement walls (intermingled with mirrored glass tiles sections, very 70’s!). The paneling was glued on, thus that led to all the drywall being torn out. As Erik was looking for drywall installers, he finds a son of a church friend who says that he could do the job because none of his drywall contractors wanted to do such a small job. He came on the following Tuesday and then a drywaller called to say that yes, he actually would take the job of mudding. The drywall was hung on Tuesday and the mudder came the next day. It is not an easy feat to get contractors to come right away and get the job done. Tender mercies! In April, I started to get antsy about the kitchen renovation. One day, while standing there looking at the kitchen, the Lord says to me, “You don’t have time to do the kitchen renovation that you want to do.” My whiny voice appeared, “Well, we’ve already ripped out half the sunshine ceiling. What do you want us to do?” The Lord instructed me to call Greenwood Furniture. I’ve known Jack and his family for years and know of the quality work that they produce, so I went to their website and saw what they did to some kitchens. Erik agreed to call them. He called them on a Wednesday. By Thursday, they were at our home, doing preliminary measurements and a photo shoot. By Friday, they had a quote ready. By Saturday morning, we were sitting in their office going over the quote and then Jack shows us his calendar and explains that they had a family booked in for Monday but they’d had a delay in their project and they could start our job by Monday! By Saturday afternoon, we agreed to the contract and they came out to do final measurements. By Monday all the materials had been ordered. On Sunday, Erik and I were sitting in Sacrament meeting and we slowly turn and look at each other and start grinning. Erik says, “Of, course that family had a delay….” Everything was falling into place in the Lord’s time frame. While cabinets were in preparation, we needed to tear out all the light fixtures in the kitchen and take out the drywall. Our drywall guy said that he couldn’t get to us for 6 weeks because he was doing a big job for his brother. Now what? Two days later, he phones us back and said that his leave that he applied for came through and that he could come in two days to do the ceiling. It’s seems to be one miracle after another! We made a run into Calgary to go look at granite and quartz for the counter top. A more glorious sight, I don’t think I’ve ever seen. If you ever want to see the hand of the Lord at work, wander through a granite warehouse. I made a choice and we were off to the races. The quotes came from two different businesses. While I was at a Rotary conference, Erik calls to ask what we should do. One company could install by that Thursday; the other would be two weeks off. I said to take the soonest possible as the Lord’s time seems to be quite precious. When I came home, I had the big reveal…I laid my face on the granite and inhaled. I daresay, I licked it too! You know that saying, “Once you lick it, it’s yours!” I heard that courtesy of Kaye England and use it to my advantage. Many people have said to me, Why go to all this work, only to sell it to someone else?” There are many reasons, but according to my Papa, “Always leave a place better than when you found it.” Yes, it looks stunning, but I know that the Lord has a need for us to be somewhere else. I don’t feel anxious about doing all this and leaving it behind. There is a purpose for it, probably more than one. One of my friends came into the store one day and said, “Don’t worry about WHEN something will happen, because down the road, you will see that certain things had to happen first before THAT could happen. True words, my friend! All will be revealed in the Lord’s time and right now it feels like we are on a roller coaster zooming along. Everyday is not a bed of roses filled with happiness. We all experience anxiety to some degree. Some days, Erik is in panic mode and I am the calm one and on other days it is reversed. I have suggested that when we get up in the morning that we look at each other and ask whose day it is to be in panic mode, because only one of us at a time is allowed. Starting the day with prayer and scriptures definitely calms our souls and minds and prepares us for what He needs us to do that day. So, from our little baby steps, we have progressed to giant leaps. My husband looked at me recently and told me how he appreciates my surety in the Lord and my faith. I know that the Lord will not fail me but I must constantly be on guard against the adversary who does not want us to progress. Who do I choose to follow? Definitely and without a doubt, the Lord! I came to a point in my life a couple of years ago where I felt these promptings to know what God’s will was for me. What did He want me to do with my life? Was I anywhere close to doing what He wanted for me? I was starting to question whether my choices for my life could be better if I asked His advice. So, my dear husband also came to a crux in his life as to his career and where we are living. He was driving 2 hours each way to work everyday. In June of 2014, he came home one day and said, “That’s it…I’m done!” We thought about what that meant and we thought that maybe we had to move to Calgary to be closer to his work. I dug in my heels a bit because we live on a gorgeous acreage and to move to city living just seemed wrong. Then I said that while living in the suburbs, he would still have at least a 45 minute commute to work. Why bother? 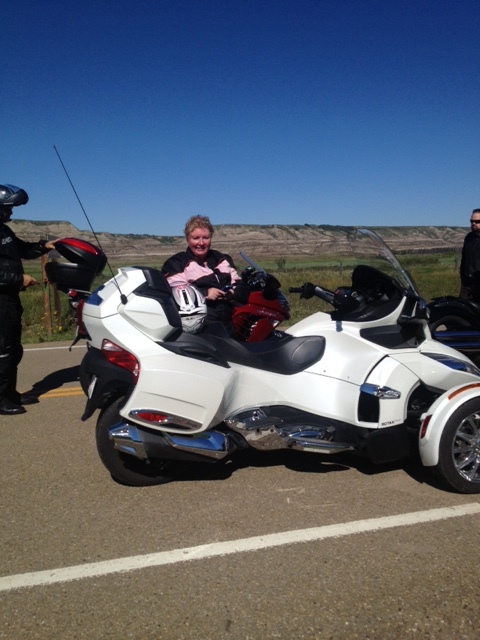 We even drove to the northwest area of Calgary to see some acreages, but I just wasn’t feeling it. I suggested that we go to the temple and pray and ask God if He had an idea for us. Erik thought that was a good idea and off we went. I can only say that it was the start of many miraculous occurrences that have happened in our journey this past year. I asked the Lord if Erik needed to change jobs and right away the Lord replied and said emphatically, “Yes, he does!” Then I asked what the Lord needed us to do; where did He need us to go. He showed me a vision of blue water, a big sun and a strip of land with no trees. I was so shocked at seeing this vision that I immediately said, “That’s NOT Alberta!” I should have asked, “Where IS that?” As we drove home, we compared notes over what we felt and saw in the temple. Erik definitely had the prompting to change jobs. We started thinking about where the Lord wanted us to go that was by an ocean and where a Petroleum Engineer could work. Erik was checking job boards online and found something in Australia. He applied for a job in Brisbane and we waited to hear about it. Meanwhile, I went online to check out housing and the Lord told me that Brisbane was not the place we would be going. We carried on for the rest of the summer; marrying off a son and enjoying time at the lake. The job in Brisbane was not to be and we contemplated what we needed to do to become more mobile. By October, I was in Houston at a trade show and on one of the days on the show floor, I ran into a friend from England. She wanted to introduce me to a fellow shop owner from Dubai. The shop owner had an employee with her and the four of us stood together talking. I told them about my vision in the temple and that we hadn’t figured out yet where that was. They all looked at me and my friend, Karin said,”Well, that’s Dubai!” The other two concurred and I was struck with a tingling feeling. I immediately texted my husband and asked how he felt about living in Dubai. He replied that he thought that he could get work there. I received an overwhelming feeling about researching Dubai and finding out all that I could. It was hard to focus on my purpose for the trade show and shopping for my business. When I came home, Erik picked me up from the airport and we went home, had supper and then turned on the television. A show (House Hunter’s International) came on that we love to watch. That episode was all about someone moving to Dubai! We turned to each other and said, “I think we got the message loud and clear.” It’s interesting that the Lord was sending us to Dubai and we never considered it at all in our thoughts about where to go. As the two of us sat together for Family Home Evening each week, we started planning what we needed to do to make our move overseas. 1) Sell the acreage; 2) Sell the business and building; 3) Sell the rental properties. After 25 years in Olds, we had deep roots and we needed to take a big ax to our lives and start chopping away. We prayerfully consulted the Lord on what we needed to do and our story is about all the miracles that have occurred and continue to do so. Emily Berg on Hello world! Anna Jackson on Hello world!